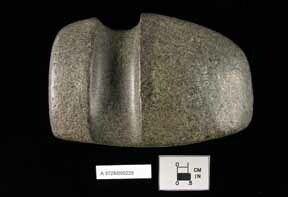 | caption = Large ground stone axe has a wide, deep groove near the poll end that extends from the flat base around the sides and top, which functioned to attach the axe head to a handle. The base is flat. Opposite end tapers to a thin, wide cutting edge. The surface of the igneous rock is very dark gray and light olive gray and is very highly polished. Item was found in Hamilton County, Ohio.